South Africa is surrounded side by side by breathtaking mountains. South Africa offers world-class climbing, surfing, diving, hiking, horseback safaris, mountain biking, river rafting etc. There are over a hundred listed paragliding or hang gliding launch sites were you can enjoy.Thousands of kilometres of hiking trails around the country in desert, forest,you can see. South Africa is the most scenic and beautiful place for tourists to participate in adventure activities.South Africa offers a large variety of adventure activities,sports etc.On the border of the Eastern and Western Cape has the highest commercial bungee jump in the world. 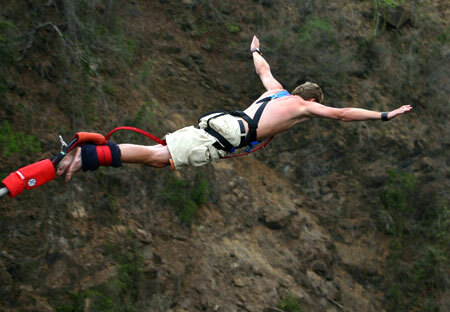 South Africa is home of the highest bungi jump, biggest sand dunes and tallest mountain. Abseiling table mountain - The world famous Table Mountain soars above Cape Town at 1000 metres above sea level. The "long drop" is 112m high - and about a kilometre above the city - making it the world's highest commercial abseil. The views from here are breathtaking. Bungee jumping - The highest commercial Bungy Jump in the world stands at 216m high and is at the Bloukrans Bridge up the Garden Route of South Africa. Canoeing, rafting & kayaking - The most popular is the Orange,it's a long, green-fringed oasis running through the mountainous desert area. Incredibly scenic, it also has a few fun rapids.The trail of approximately 75km is suitable for the complete novice and specially designed, stable, 2-man, Indian-type canoes makes it safe for the whole family, both young and old. There is some fun canoeing in the lakes area of the Garden Route, especially Wilderness and Knysna Lagoon. Fishing - Shore angling is the most popular form of fishing - perhaps because it is the most accessible. Horseback safaris – If you're comfortable on a horse you can take a ride through magnificent mountain scenery and also through vineyards. Kloofing - Jumps range from 3 meters high to 22 meters high and it might seem crazy but it will give you an xtreme adventure xperience. Rock climbing - South Africa offers some of the best, and most diverse, rock climbing in the world. Outside Durban, there are also a lot of sport climbs. The Cedarberg, two-and-a-half hours drive north of Cape Town, is a world-class bouldering area - and boasts some of the best rock climbing routes in the country.Cape Town is built around Table Mountain, a national park consisting of two great, hard rock types - Table Mountain sandstone, and Cape granite, which offers fantastic friction climbing. Scuba diving - South Africa has an enormously long coastline, which isn't quite within the usual range for tropical diving. Mozambique Current flows down our east coast and at Sodwana Bay we have the most southerly coral reefs in the world.You can see pretty colourful fish and some great nudibranchs, including the outrageous Spanish dancer. Whale sharks, turtles, dolphins and ragged tooth sharks are often seen in specific areas. Whale Watching - During the correct seasons, Southern Right Whales make the coastline their home and often come here to give birth. Hermanus, a beautiful fishing village up the coast from Cape Town, is a destination for some of the world's best land based and boat whale watching.